With the exception of the footprints, I’m pretty sure I love these. They’re both made by Mexican pharmaceutical company KSK, which likely accounts for their kitschy, understated, not-typically-in-your-face-American design. At the same time, I can’t help but acknowledge that these designs don’t exactly exude that “rub me on your bits and bobs ’cause I’ll fix ya right up” quality that one looks for in a box of salve. 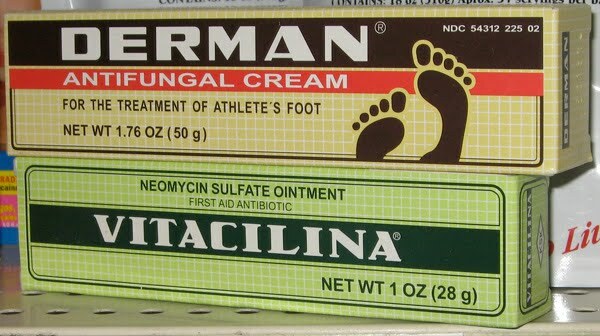 Love the Vitacilina one! Not so much the Derman one, however. The footprints are distracting and the fonts are a bit too retro to be pr*tty. Good design. Bad design. One of each. A few times a week, more or less. Item One: What's the point? Item Two: Go ahead. Disagree.